Beth - Yes, absolutely. I really love snakes. I think that they're phenomenal animals and today, I'm going to be talking about the amazing ways in which they eat. So first of all, I do have a question. Who would like a free dinner? Quite a lot of hands gone up. Well, I'm going to tell you now what you have to do. I have here a watermelon and whoever can eat this watermelon - good old steakhouse challenge gets - it for free. There are two rules. One is, you're not allowed to break, cut it up or chew it. So, you have to swallow it whole. We've still got one volunteer and you've got to do it without choking to death in the process. But what I'm here to tell you is that if there was a snake that was the same size as you, that had a head or jaw the same size as yours, it would have absolutely no problem with this. Snakes can swallow things that are much bigger than the size of their own heads or even thicker than the width of their bodies. A lot of people have heard the gold old myth that when snakes are eating, they unhinge their jaws. That is not quite correct. The truth is that their jaws are hinged in a very different way to ours. Whereas we have the little hinge at the back of our jaws. If you put your fingers up, you could probably feel it as you open and close your mouth. With snakes, it's very different. First of all, they have two hinges right there and a small bone in between them. That allows them to extend their gape. If you now take your finger and touch the bottom of your chin just right in the middle, have a feel around to the bone there, you can probably feel sort of slightly lumpy shape right in the middle where the lower left and right jaws meet. They're fused together by a bone. In snakes, that does not happen. The lower jaws on the left and right side are separate. They are not connected at all except by soft tissues or by skin and very stretchy ligaments which means that not only can the snake open its mouth a lot wider, but the lower left and right jaw can actually spread out from each other. This means that snake can take in food that's much larger than the size of its own head when its mouth was closed. But then we still have several problems with swallowing such a large meal. First of all, it's very, very fragile, this structure, with the many bones and the many joints. That means that it can't really bite or chew its meals. So it has this really, really clever mechanism. The teeth, they're curved around and they point towards the back of the mouth. And as the snake opens its mouth and starts to get it around the food, the left hand side of the jaw will release slightly and slide forward over the food. Once it's further forward than the right side, it will dig in and grip on tightly. Then as it pulls back, the right side releases slightly and pushes forward over the food, grabs on again tightly and it starts to pull back. And this repeats many times, this sort of ratcheting mechanism, to slowly pull the food down into the gullet of the snake. Because the skin is so elastic, it's rather like if you stuck a tennis ball down a sock, you see a large lump in the middle of the snake after it's eaten. Ginny - You've actually brought another couple of guests along with you. Who have you brought? Beth - We have Mandy here from Luton Reptile Rescue and she has brought two of her wonderful pets with her today. So, there's the rather small royal python called Sharka. Ginny - Hi, Sharka. So, he's about 4 feet long. He's got beautiful scales - mottled brown and beige and he's now just winding his way up my arm. Beth - If we look at Sharka's head and say, his head is less than 2 inches long, about an inch wide at the widest point. Ginny - Yeah. It does look very tiny. So, what kind of animals would he be able to eat? Beth - He would be able to eat rats. Ginny - Wow! Now, we've got another bigger snake here. Does anyone want to come up and meet him? What's your name? 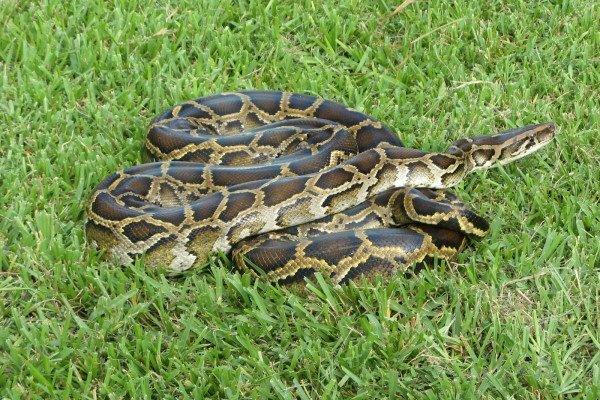 Beth - This is Tsotsi Burmese python.Totsi is quite a bit larger. Tsotsi is about 10 foot long. He weighs about 20 kilos. So, you're absolutely welcome to touch. Ginny - What does he feel like? Freddie - Smooth, very smooth. Ginny - I'm now wearing him as a feather boa. He slightly feels like he's tightening around my neck which I'm thinking is maybe not the best idea. Beth - No, you're just his ideal radiator. Ginny - They're very cold to touch, but they're not at all slimy. They're smooth and scaly. I might have to give him back. He keeps trying to lick my ear which is a little bit distracting. So, Freddie is now going to hold the small one. We're putting him around his neck. How does that feel? Ginny - So, he's just draping himself across your neck. They do feel beautiful don't they? Beth - Yes, they have very, very smooth scales. They also keep themselves very clean. So, if you like a nice clean house, a snake is a perfect pet for you because they're fastidious about personal hygiene. Ginny - And I believe they don't need feeding very often. Beth - No, absolutely not. One of the reasons that they eat such large amounts when they can is that they really don't eat very often. The only reason that they eat is to get the nutrients that they need in order to grow and repair any injuries that they might have. Ginny - So unlike us, you have to eat in order to just stay alive. They only need to eat so that they can grow and heal. Beth - Yup, pretty much. So, they don't need to eat very much at all. Ginny - We've got a question from the audience. Male - Could Tsotsi eat the watermelon now? Ginny - So, he's about 2 inches long and an inch wide. At the biggest, maybe an inch and a half at the biggest point but by the time you get down to his nose, he's only less than an inch wide. Beth - But he could quite easily, if he want to take out his jaws over this watermelon. The foods that he eats often are decently large rabbits. Ginny - Okay, I think we should probably say a huge thank you to Mandy from Luton Reptile Rescue. Let's go over to the judges and see what they thought about that. Georgia - We're getting acquainted with Sharka. I'm absolutely enamoured. Max - In the process of playing with the snake, you can really feel the strength in the muscles of the snake. Are there any other ways that snakes kill their food before then managing to cram it in their face? Beth - You do primarily get the venomous snakes and the constrictors. In terms of the constrictors, what they do is they tend to wrap around the ribcage and they can feel very well the heartbeat of what they've wrapped around. They will continue to constrict until that heartbeat stops. What they do is rather than just simply squeezing you until you can't breathe, as you breath out, they will tighten and then they will use all that muscle to hold you very still so that you can't expand your ribcage to breathe in again. And then as you try to breathe out more to give yourself some room to breathe in, they tighten again. And that is how it works. When I say you, obviously, I don't mean you as humans. I mean, the small animals that they tend to prefer to feed on. George - With the venomous snakes, if they poison their prey, how come they eat it? Beth - There are two things to think about. One is that a lot of venoms are only harmful when injected into the bloodstream. So, you can actually consume them by swallowing them down into your stomach and it wouldn't harm you. Another reason is that as you know, for a lot of snake bites, a lot of venomous bites, we have developed anti-venoms and these are actually often developed from the poison glands of the snakes that produce those venoms because they contain biochemical molecules that can protect you from the negative effects. Ginny - Okay, I think it's time to get the scores from our judges please. Georgia - I'm going to give snakes an 8. Max - And another 8 definitely for actually getting to meet the snakes is incredible. Thank you very much. Ginny - A round of applause for Beth Barry on the snakes. Now, I think it's about time we have an update. We've only got one animal left to compete. So, how is our leader board shaping up, Heather? Heather - Well unfortunately, it seems like our grackles stayed on the other side of the pond with a 19. Our sticklebacks are still heading downstream with 21.5. Our geckos are stuck in 4th place with 22. Because our snakes slithered ahead into 3rd place with 23. Again caterpillars, an inch behind with 25.5. Our leaders, the moles dug in for victory with 26. But could our final animal swoop in to take the victory?